It's hard to notice, unless you're paying fanatically close attention, but before Loki is King of Asgard in Thor and before he got his staff from Thanos in Avengers, his weapon of choice was throwing knives. He even uses a throwing knife or two in the Avengers. But most people don't realize that because they're not obsessed like some of us. So for my Loki cosplay, I want to make some throwing knives. 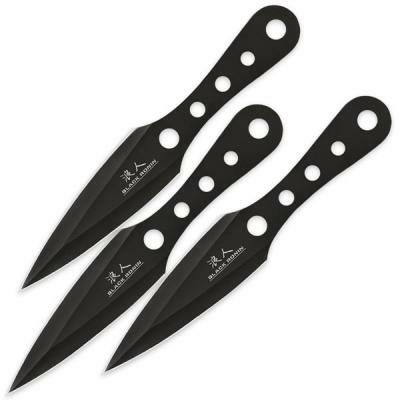 I would just buy some throwing knives (they're not that expensive) if (a) I could ever get them through airport security and (b) I wouldn't get in trouble at dragon*con for having an open blade that's not peace bonded. If I want to pose with throwing knives in my hand they're going to need to be fake and made of something that's not likely to injure someone. When that picture came up on google my first thought was "oh no, I'm not that crafty." Because I'm not crafty. At all. Give me some variables and an equation and I'll calculate until the cows come home. Give me a laptop or a pen and paper and I'll write you whatever you want. But glue guns and paint? Nope. I'm hopeless. And Loki's throwing knives are a tad bit complicated and crazy looking. 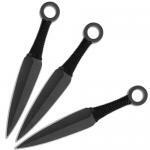 My next step was to find real throwing knives to see what they look like in reality, and not just in Asgard. I found a website called knife-depot and they showed me the knives you see to the left and right of this paragraph. These definitely looked more feasible to make but still a little crazy. 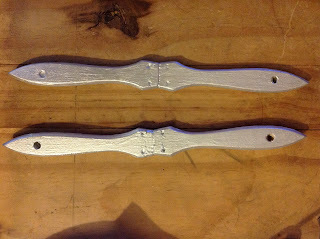 What's a non-crafty girl to do when she's trying to make some weapons for her cosplay? Well, I don't know what everyone else does, but I went to Hobby Lobby. I try not to go to Hobby Lobby if I don't have to, because I feel like every time I go there I end up dropping scads of money on fairly useless stuff. But this time I went in with a mission. 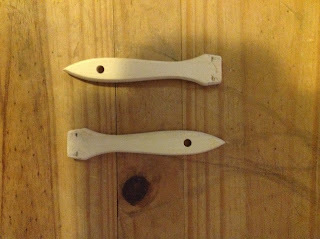 I had no idea how to make throwing knives but I knew that walking around the store would give me inspiration and it did. I ended up buying paintbrushes, wood glue, and metallic silver wood paint. So first step! 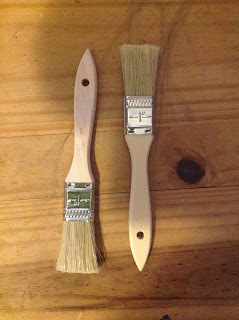 Take two ordinary paint wooden paint brushes. Remove the metal holding the brush part onto the wood. Now this was a little harder than it sounds. 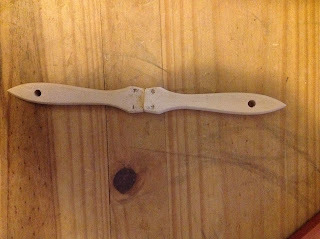 It involved a square blade knife that I could shove between the metal and wood and then use to pry the metal away. The metal wasn't held on very tightly. It was just jammed in at certain spots that you needed to loosen. And the metal was very bendy. It took me like fifteen minutes to figure out how to do one and then one minute to do the rest. 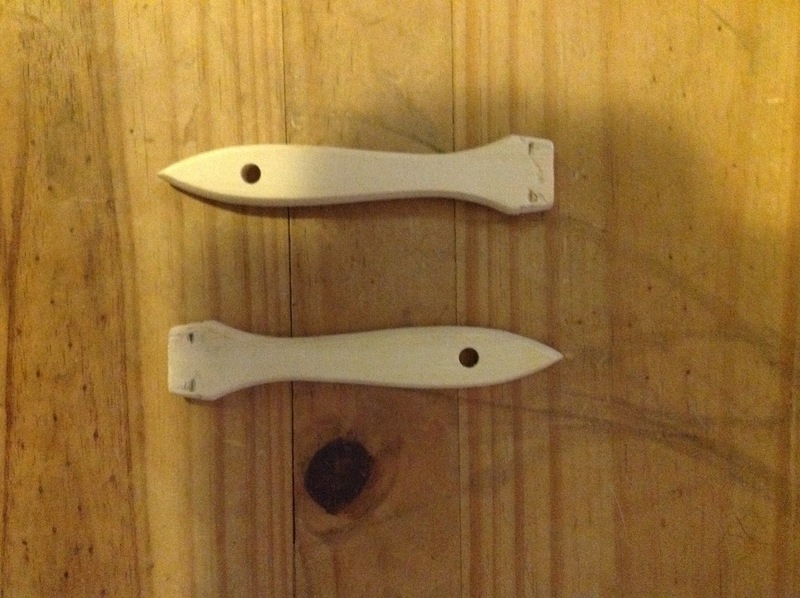 Anyway, you end up with two wooden handles, like so. Not too shabby if I do say so myself. Looking at them alone you may not know what they are, but I think when I'm holding them and wielding them menacingly for photos, people will get the idea. And they look really shiny and silver in real life. The photo didn't capture that so well. 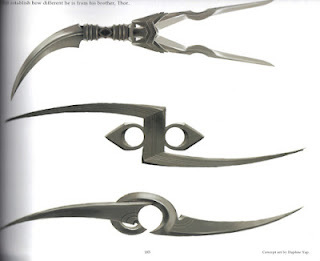 They don't look much like Loki's knives but I think they sort of have the flavor of throwing knives, where both sides are metal and balance each other. Hopefully they'll look good with the full costume! Hi just wondering, how big was the brushes?